Our beta glucan ingredient is Wellmune ®, which is extracted intact from the cell wall of baker’s yeast. In order to be effective, the beta glucan molecule must bind to the glucan receptor sites on the macrophage cells in the intestinal tract and thereafter to neutrophil cells, which are vital components of the immune system. Only intact and purified beta glucan molecules are able to do this effectively. Our supplier of the patented Wellmune ingredient is Kerry Group, who have conducted extensive clinical trials to prove the effectiveness of this natural ingredient in enhancing the immune system. Their animated explanation on the mechanism of beta glucans explains this. Click here to view video. ONLY Wellmune reaches a proven level of purity and effectiveness. Any other 1-3, 1-6 beta glucans ingredient will be below the level of purity to be effective; otherwise it will infringe the patent. Wellmune is listed on the US Food and Drug Administration’s (FDA) GRAS list – Generally Recognized As Safe. 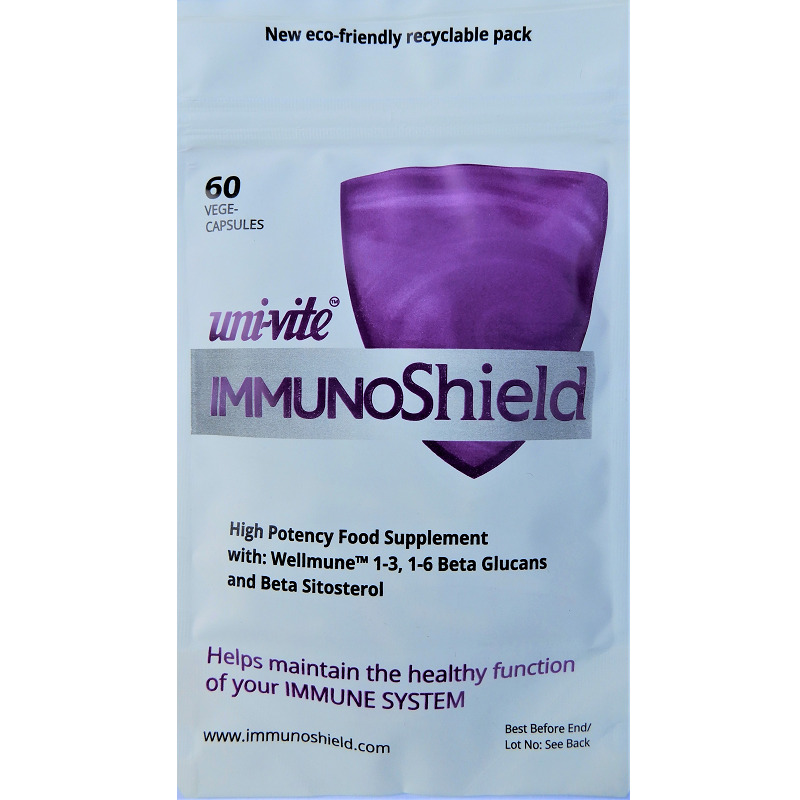 ImmunoShield is safe and non-toxic, and can be taken every day for an unlimited period, without reduction in effectiveness or unwanted build-up in the body. It has no known adverse reactions when taken with other pharmaceutical drugs or supplements. Wellmune is a pure isolate of a food ingredient and does not contain enough yeast protein to cause an allergic reaction. Derived from baker’s yeast, it is naturally gluten-free.